In an increasingly eco-conscious world, where we get our stuff from and how it’s made is becoming more important every day. Greater understanding of our impact on the planet is leading people to make sustainable and more environmentally friendly choices in nearly every aspect of life, including furniture. The good news is there are a lot of great products out there which not only help you go green, but don’t compromise on performance, style and design. So whether you are looking for something for your home or your place of work, here are a few key points to consider before making that purchase. In Europe, we currently use 16 tonnes of material per person per year, of which 6 tonnes become waste. In 2010, total waste production in the EU amounted to 2,5 billion tons. From this total only a limited (albeit increasing) share (36%) was recycled, while the rest was land-filled or burned, of which some 600 million tons could be recycled or reused. Rearranging the Furniture, a report by the UK’s RSA’s (Royal Society for the encouragement of Arts, Manufacturing and Commerce) projected that over 80% of the environmental impact of products we use every day is built in at the concept design stage, and that furniture is an area of concern when it comes to end of life disposal. If furniture isn’t designed to be recycled, it can be almost impossible to recycle it, and is simply thrown away. So what should you look out for? When purchasing your furniture, find out if it has been designed for disassembly. Many manufacturers will claim that their product contain 95 to 100% recyclable material. But quite often pieces of furniture are comprised of different material irreversibly glued or bound together, so even if the different materials taken alone are recyclable, it may be impossible to actually recycle because they are impossible to separate. For instance, a desk may have a non-recyclable finish, or a chair might have non-recyclable foam glued to the seat base. If you have an office with hundreds of items, it becomes impractical and uneconomical to sort your furniture at the end of its life. The upholstery of an RH chair is attached with a patented method. The carefully placed and sewn seems keep the fabric in place for years of intensive use, avoiding using glue whilst facilitating re-upholstering or disassembly in connection with recycling. 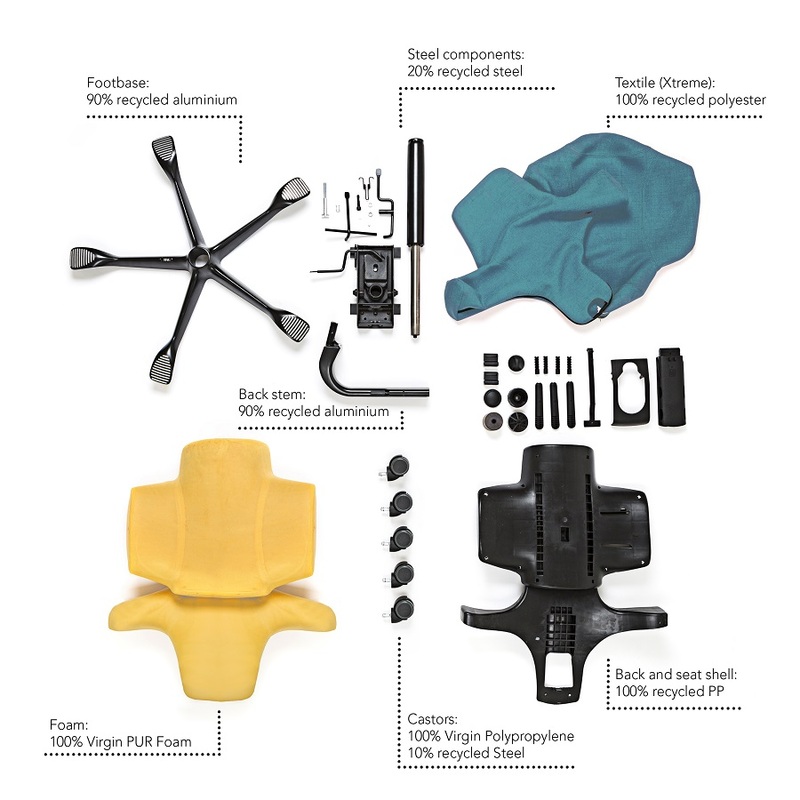 Here at Flokk many of our products are designed for disassembly, and through clever stitching techniques, we are able to hold our seat pads together without the use of glue. Simply one or two snips and the pieces are ready to come apart without any undue stress. Flokk also collaborates with the Dutch company OPNIEUW to give a second life to old Flokk products by taking them back for re-using, repairing, refurbishing or recycling them. And in the end selling them on their web-shop for a reasonable price. Flokk is targeting to expand this take-back and second life business model through external partnerships globally. Steel is the most recycled material on the planet, more than all other materials combined. 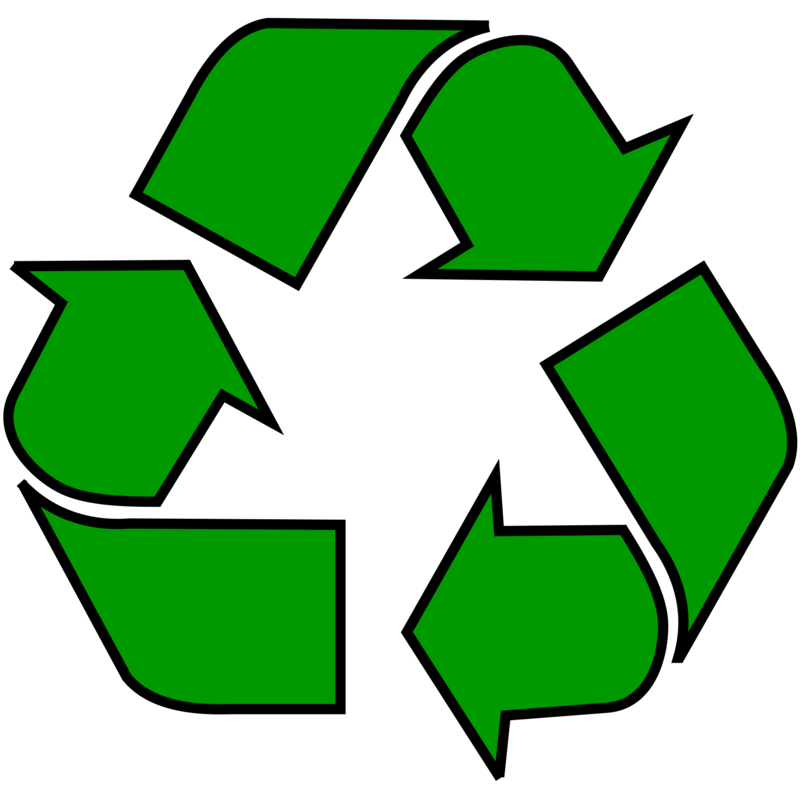 In 2012 the global recycling rate stood at 88%. With plastics, the difference couldn’t be more startling. Research published in 2017 suggested 91% of plastic created hasn’t been recycled. 6.3 billion tons of plastic currently litters our planet, and with most plastics taking up to 400 years to degrade, it will be sticking around for a while. This is a vast amount of waste that we should be looking to harness and reuse, creating new things, whilst at the same time cleaning up our planet. Therefore it’s not simply enough for furniture to be recyclable, but to be made out of recycled materials too. Again, these facts should be easy to find out when you are looking at prospective furniture. A little bit of research may lead to some interesting results. Materials such as aluminium, steel and polypropylene make just as good products the second (or 100th!) time around as the first. The components of the HÅG Capisco have continually been improved, today containing a majority of recycled components which are easy to disassemble and recycle. Flokk brand HÅG first turned their attention to recycled materials back in 1995, transforming used bottle caps into chair parts. Since then HÅG have continually increased the amount of recycled PP used during production across all products, and have added recycled steel and aluminium into production lines. One aspect often overlooked when looking for sustainable furniture is durability. If something is built to last or is easily repaired, it lessens the likelihood of being thrown away, and can even save you money in the long run, stopping you from purchasing a replacement piece. The environmental impact of manufacturing two items compared to one is also something to consider. Look out for manufacturers who offer long life guarantees, have readily available spare parts or offer refurbishment schemes. Contemporary RH chairs are designed for a circular flow with a high degree of recycling. Parts subject to wear and tear, such as wheels and armrests can be ordered as spare parts. Volatile organic compounds (VOCs) are chemicals that evaporate at room temperature. Most scents and odor you smell are VOCs gases. Some occur naturally and some are synthetic and can be dangerous to human health or cause harm to the environment. 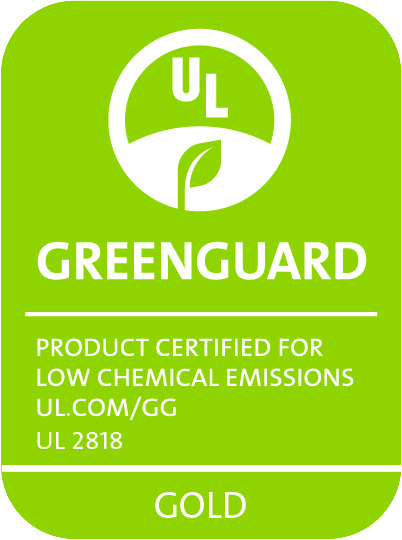 There is one easy way to avoid VOCs – lookout for GREENGUARD certified products. This is an assurance that products meet a strict chemical emission limit, backing sustainability claims with empirical scientific data from a third-party organisation. One quick and easy way to work out the environmental credentials of a piece of furniture is to examine its Environmental Product Declaration (EPD). An EPD is an independently verified and registered document that communicates transparent and comparable information about the life-cycle environmental impact of products. It calculates the complete impact on the environment, from extraction of raw materials to factory gate out..
Having an EPD does not necessarily mean that a product is environmentally friendly, but it gives you a clear indication of the total impact the product has, and you can compare product EPD’s to see the difference between manufacturers. 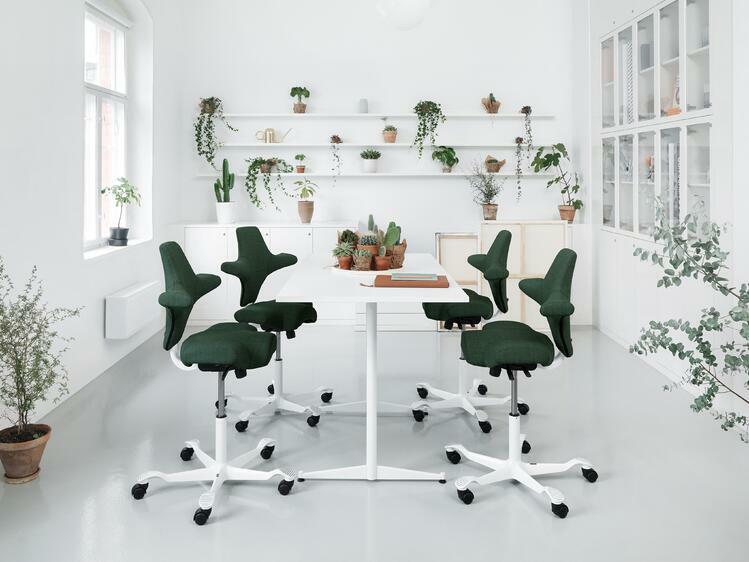 In 2004, Flokk brand HÅG became the first furniture manufacturer to apply for an EPD, acknowledging that HÅG have some of the lowest CO2 emissions in the furniture industry, and now all Flokk brands are working to document their product ranges with EPD to provide a transparent view on our manufacturing process. A major consideration in environmentally friendly furniture is packaging. Many goods come with excessive packaging that could be recycled, but certain types of packaging are not able to be recycled including Styrofoam and certain plastics. You can avoid this by choosing items that aren’t excessively packaged, or use mainly materials such as cardboard, or recyclable plastic. This is often a difficult area, due to a customers demand for undamaged goods, and the bulkiness of furniture. This is just a rough guide to some of the strongest ways to measure how environmentally friendly your furniture is. Many countries carry their own standards, such as Norway’s Ecolabel Swan or German Blue Angel, but make sure you do your research to check out that they are strict and unbiased.